Compose quickly and easily – your bass lines, your drums patterns, your riffs are just a few clicks away! Edit them and mix them with ease and velocity You are used to on MacOS. of few sliders and clicks and You can control anything! Techno Drive sounds like an authentic analog synthesizer for the rhythm sections or the bass lines. « Simmons like » or « TR like » sounds are available for the drums. if you need to – no need for any modular system anymore! Record your performances. Improvise techno songs, rap and dance rhythm sections, or anything else that drives You. 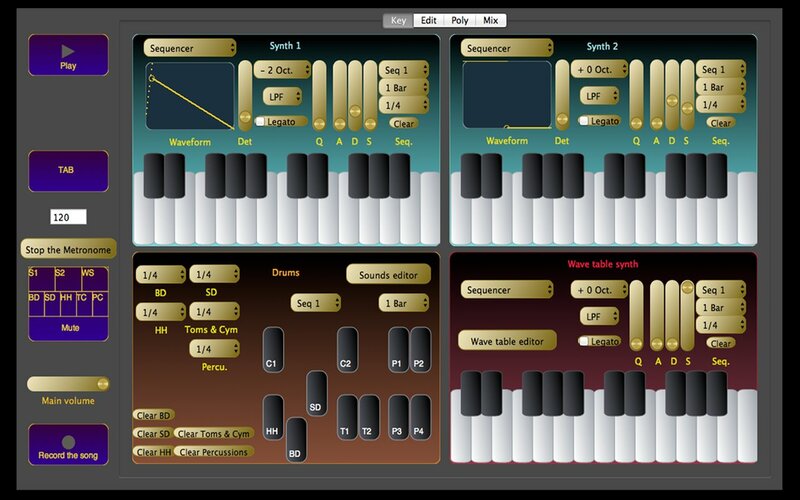 Modulate the sound, experiment new directions with few clicks. Just try it! to loop your best performances in your future hit. Huge sound, fast and ergonomic user interface : that’s what Techno Drive is! Buy Techno Drive on the Mac Apple Store.